The home provides a new and challenging environment for data management, with both the number of storage-enhanced devices and the amount/variety of content growing rapidly. Moreover, devices in the home are extremely heterogeneous in computational power, storage capacity, and usage model. We need much simpler and more automated data management approaches to allow users to manage data in this new environment, sharing information across devices, finding information when needed, handling reliability issues, and so on. Perspective is a distributed data management system for home/consumer storage architected around the concept of a view. A view is a description of data about which a device is interested, published to other Perspective devices. Views provide a solid building block for efficient consistency management, inter-device search, device departure and arrival handling, and data protection. Within Perspective, we are also exploring automated data distribution approaches, effective search mechanisms, and security management for home/consumer storage. 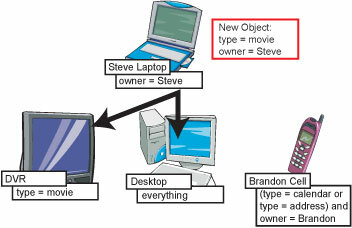 This diagram shows how views facilitate object update or addition. In this case, Steve’s laptop has received a new movie (perhaps from the Internet). Because it holds all the views in the system, it knows that both the desktop and DVR need to see update messages for this new object. Note that the cell phone’s view does not include the object and, therefore, does not need to see the update.